Chorley boss Matt Jansen does not know what to expect when his side welcome Tamworth to Victory Park on Saturday. The Midlands-based outfit moved up to seventh in the National League North by winning an eight-goal thriller against Stalybridge Celtic last weekend. According to Jansen that result was a little bit against the norm as the Lambs are perceived as a conservative side who like to keep things tight and nick a goal at the other end. Jansen said: “I had Tamworth watched on Saturday. “They had a good 5-3 win at Stalybridge Celtic. My scout said they were a very strong side. “Funnily enough before the game he said they were a side which don’t concede too many and don’t score too many and then they win 5-3. “They are up there near the play-offs. The three points Tamworth collected on Saturday means they moved to within eight points of a play-off place – six points clear of Chorley, who are down in 13th. The Magpies were disappointed to lose narrowly 1-0 at in-form Alfreton on Saturday. Jansen were down to the bare bones of their squad without James Dean (calf) and Dale Whitham (illness), while skipper Andy Teague took a position on the substitutes’ bench less than 100% fit. 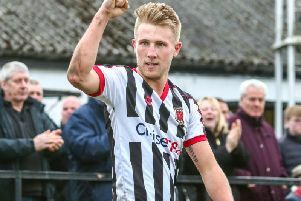 The team was also without striker Josh Hine, who joined NPL Premier Division big spenders Salford City in the lead-up to the game. Jansen is hopeful of bolstering his squad ahead of the visit of Tamworth, although he admits he may have to remain patient to get the players he wants. He is though confident that both Teague and Whitham will be back to full fitness. “I have a couple of signings in mind,” said Jansen. “But I can’t push it any quicker than we are doing. Sometimes it is in other people’s hands but we are trying to get the right players in.